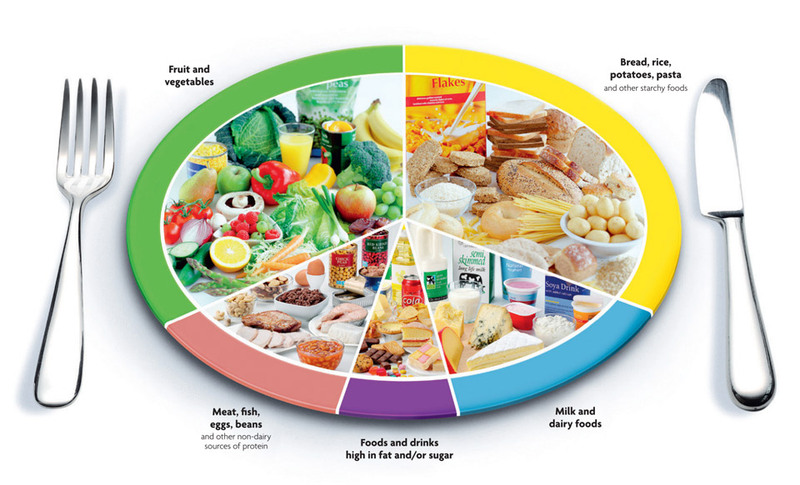 The eatwell plate shows the types and proportions of foods that make up a healthy balanced diet. The eatwell plate is a pictorial representation of the kind of diet that will support achievement of the Scottish Dietary Goals. This means that there are some type’s foods which we should aim to eat more of, and some which we should only eat a small amount of. Plenty of starchy foods, particularly wholegrain varieties. Some protein rich foods (e.g. meat, fish and eggs). Some milk and dairy foods. Only include a small amount of foods (and drinks) which are high in fat and/or sugar. It’s a good idea to try to get this balance right every day, but you don’t need to do it at every meal. It is likely however that you will find it easier to get the balance right over a period of a week. A worked example of what a balanced week looks like can be found on the Eatwell Everyday website. Avoid using the phrase “everything in moderation” particularly when discussing food and drink that should only be eaten in small amounts. This is a common response; however this is not the message of the eatwell plate.